Meringue is something Iusually only make as a side product. I got to admit, normally they are not my favourite treat. But I like doing icecream, and I particularily like doing it French style, but this involves leftover eggwhites. 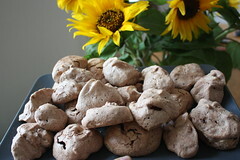 In general, I guess there are more recipes calling for eggyolks than eggwhites, so from time to time I try to make some meringue or some cookies popular in Austria especially around Christmas, called "Kokusbusserl" or "Nussbussserl" which literally means "coconut / nut peck", which are similar to meringue. But lets get back to the main topic: The meringue went all fine. Iopted for the "playing around" variation and used shredded toasted coconut instead of chocolate. It was easy done, got firm but still chwy in the middle and tastes surprisingly good. I don't know where I lost the coconut shreds. They have a slight taste of it, but not very much. But you know what? I guess I am happy with this little idea of coconut. As overall, I am happy with these. They turned out so much better than expected! When I see a recipe on the TWD schedule I surely will like, I am eager to do it and can't wait for the week to come. But when I see a recipe that does not sound so appealing to me, I am happy someone has chosen it, because I would have never tried it on my own. And I definitely like experiences that I would not have taken if it was not for someone else. So - this week props go out to Mike of Ugly Food for an Ugly Dude. Turn to his page for the fast and easy recipe or have a look into Dorie's book on page 155. I have never made meringues. Thanks to Dorie for pushing me out of my comfort zone. These were yummy. Have a great week. I loved making these. 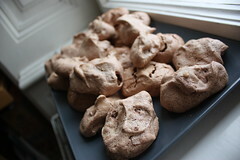 I think the mini chips I used also disappeared into the meringues, but they were tasty so I wasn't worried. These were so easy. Definitely a good way to use up all those leftover whites. I added coconut to mine too and liked them better.